As if Boxy Girl wasn't beautiful enough, there are now four new stacks to further customize your original acrylic organizer. Store your makeup, jewelry and more in the best product available, invented by a woman and made in the USA! If I was to walk into your bathroom right now, what would I find on your countertop? Are there lipsticks and makeup brushes and pots of cream strewn all over your vanity? Do you have a few mismatched coffee mugs holding your mascaras and lip glosses? Or are they all shoved into a drawer? I, for one, do not like clutter. I also like pretty things. If you do, too, I have the perfect solution for you: Boxy Girl. 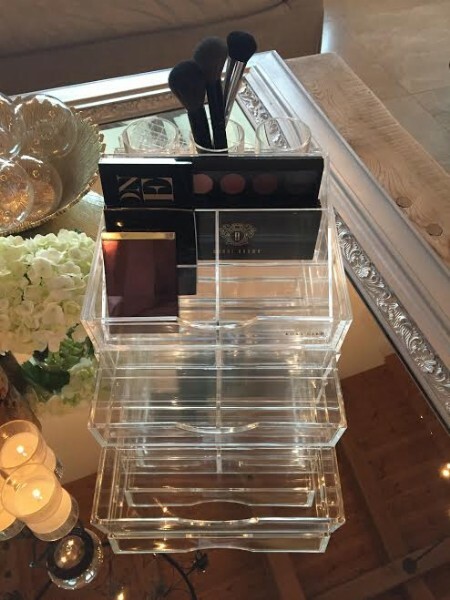 Boxy Girl is a high quality acrylic beauty organizer. This thing is gorgeous! It consists of stackable trays made of Lucite (durable and scratch resistant) with removable dividers that you can customize in the best way to suit your needs. You can stack two, four, six or as many as you want in any configuration. The trays are made with a single mold injection process, so there is no glue that will discolor or peel over time. I've had mine for almost two years and it still looks brand new. All I need to do is wipe it down with a soapy washcloth every so often to keep it clean. The beautiful thing about Boxy Girl is not just how pretty and functional it is, but its incredible versatility. Yes, you can load it with beauty products, but it also works for jewelry, office supplies, crafting items - even Legos! It beautifies any room it sits in while keeping you organized. And now, I'm so excited to share with all of you that Boxy Girl has unveiled its new Vanity Collection - a series of stacks that fit seamlessly into Boxy Girls' crystal-clear framework. They will help you further customize your original Boxy Girl to arrange your beauty products, jewelry and other valuables in the most chic way possible. The new items in the Vanity Collection are the Everything Stack, the Half Jewelry Stack, the Half Lip Stack and the Half Brush Stack (with more products coming soon!). You can now hang your jewelry, stand up your brushes and space out your lipsticks in coordinating Lucite organizers. Your vanity will never look prettier. When my friend Hannah, inventor of Boxy Girl, sat on my couch two summers ago and shared her story with me, I was impressed and inspired that she was making her dream a reality. I'm not one to endorse products on my blog very often, but I really believe in Hannah. And I believe in Boxy Girl. It is a luxurious, high-quality product that is so practical and useful. It's a worthy investment, and it just keeps getting better. Visit BoxyGirl.com to pick out your new stacks (on sale for a limited time) and let Hannah know I sent you! Are you looking for a health bar that is delicious, nutritious, affordable and homemade with all-natural ingredients? Look no further. Have you ever rejected something and then changed your mind? It happens. It even happened to me, and I'm one of the most stubborn people I know. Will miracles never cease?